How sticky are your lean projects? Should we even be calling them projects, or are we creating lifestyles? How often does a well-intentioned team spend a few weeks of blood, sweat and tears working out a tricky problem and changing the process for the better. . . only to see the process revert back to the original state after a few months? Perhaps something wasn't taken into account. Maybe the process just can't work the new way. Are upstream processes working against you? What about downstream? Who owns the process? Let's look at a model Lean transformation. The Lean gone Lego video shows the Red Trolley factory before and after lean took hold. But what happened a year later? Was the change still in effect? Ever hear of "Best Repeatable Cycle Time?" After all our intricate time studies, lean best practices tell us to take the best repeatable time for each process element. Realistically, we will not hit this cycle time. . . yet. There's reasons why cycle times fluctuate and those reasons need to be addressed. When we implement change, we plan for the best Lean process. And when bad things happen, the process falls apart. Exactly as it should! Because Lean makes our problems visible, instead of hiding them. But what happens when we walk away before the problems arise? The process needs to be continually tweaked and tuned to get rid of these problems. A lone lean guru won't be there when the problems come back. The process owners need to be on board and engaged. They will be the solvers. And if they aren't committed, mentored and driven, they'll just revert the process back because it worked better before! Now, I'm not going crazy. Well, maybe just a little bit. But I do realize these are just Lego people. I wanted to post these videos because they provide a little update on the Lean gone Lego video which I think is an amazing piece of work. You could use these interviews as a brief interlude during a long training session. Show the main one, then provide an update at the end of the class. I also wanted to highlight some of the issues of changing a culture and getting engagement from all levels of production. If you don't get your supervisors and shop leaders on board, you will FAIL. "We couldn't see the value because we had so much crap lying around!" "The managers listen to us. We're not as frustrated." "We're really solving our problems all together now." "We feel like it's our place now." That's right. Straight from the Lego minifigures' mouths. Have you heard anyone in your area speaking like this lately? Speaking of interviews, I was featured today on Tim McMahon's blog, A Lean Journey. 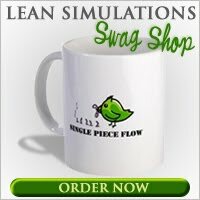 I've added this video to my comprehensive list of free lean training videos. Thank you for sharing. It's very interesting.